Apple has started selling iPhone X which is the third iPhone released for this year after iPhone 8 and iPhone 8 Plus. Of course rumors will lead to the next generation iPhone that will slide in 2018. Now analysts from KGI Securities, Ming-Chi Kuo has released a new report about a certain smartphone that will be released by Apple next year. Given the so successful iPhone X stealing attention when launched, it seems they will maintain the typical design of the iPhone X, ie with a display of bezel-less and controversial notch at the top. 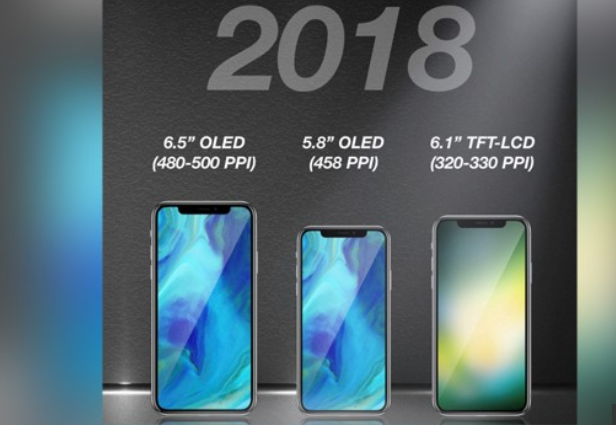 So it can be concluded that the iPhone that glide next year will have the same look as the iPhone X, which does not have a fingerprint sensor and will have a TrueDepth camera on the front. Kuo says both big and small models with OLED display panels will essentially have the same innards. For smaller models will have the same size as the iPhone X, which is 5.8 inches. While for other models intended for fans of large devices. For larger models it seems to have a 6.5-inch screen with a higher resolution than the iPhone X. It aims to achieve a pixel density of 550 ppi. As for devices that will be in position between small and large models will come with a 6.1-inch screen and will be an entry-level smartphone, where the estimated price for the device is around $ 649- $ 749. Because as an entry-level device, the screen will be lower and has a smaller pixel density than the two siblings. In addition, there will also be differences of innards that carried by this device than his two brothers to make the price of this handset to be cheaper than the other two models. In addition, materials for the body can also be cheaper. Although Kuo has a good track record for predicting Apple's plans, this report can not be confirmed yet.